As a (now former) teacher and a math/science nerd, my husband has a significant fascination with brain-based learning research, thus it was only natural that he read John Medina’s Brain Rules, followed by his Brain Rules for Baby. When we found out that we are expecting this summer (before we learned that we are expecting twins), he pulled Brain Rules for Baby off of his shelf and stuck it at the top of my TBR pile, then proceeded to pester me about it any time he saw me reading anything else at all. Brain Rules for Baby bridges the gap between what scientists know and what parents practice. Through fascinating and funny stories, Medina, a developmental molecular biologist and dad, unravels how a child’s brain develops – and what you can do to optimize it. 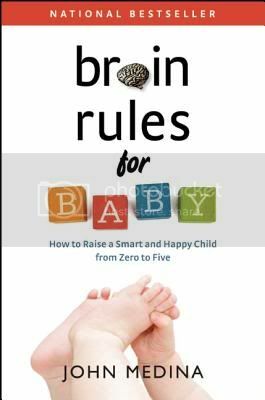 I am very conflicted as to how I felt about Brain Rules for Baby. On the one hand, it is full of fascinating and potentially helpful information for parents to understand how their children’s brains work and how their choices can influence their children’s brain development. On the other hand, it often comes off as if Medina is talking down to parents and Holy Mother of Metaphors is it ever overwritten. As far as the talking down, I don’t think that this was a purposefully disparaging move on Medina’s part. As a developmental molecular biologist he clearly needed to phrase things in layman’s terms to make it accessible to most parents, but I think he underestimated the education of parents who would be interested in a book on brain-based learning and parenting and often oversimplified or over-explained. An emotional reaction occurs. When a child’s brain is confronted with a moral dilemma, San Francisco is alerted first. The child’s deep, mostly unconscious circuitry generates an emotional reaction – a Post-it note. The signal is carried across the bridge. That message is spirited across the VMPFC, the cellular Golden Gate connecting lower and higher centers of the brain. Fact centers analyze it and decide what to do. The signal arrives at the neuroanatomical equivalent of Marin County. The child’s brain reads the note and makes up its mind about what to do. It judges right from wrong, critical from trvial, necessary from elective, and ultimately lands upon some behavioral course of action. The decision is executed. That reference to a Post-it note comes from a metaphor Medina utilizes earlier in the chapter. I really think he’s making this much wordier and more complicated than it needs to be. Perhaps he feels that the metaphor makes it easier to remember, which might be the case if they were used sparingly and if they were much simpler, but in this case it simply distracted me from what he was really trying to get across. Now, I don’t want the writing issues to completely overshadow the fact that Brain Rules for Baby really is chock full of interesting and useful information about the brain development of children in utero to about five years old. There is enough good stuff here that I would tentatively recommend it to parents of small children interested in developing their parenting style around brain-based research, but I wouldn’t ever pick it up just to learn fun and interesting new things, because of the annoyances of the writing.